Jenny and I are constantly surprised by life. Over new year’s eve we had a charming French couple stay the night. 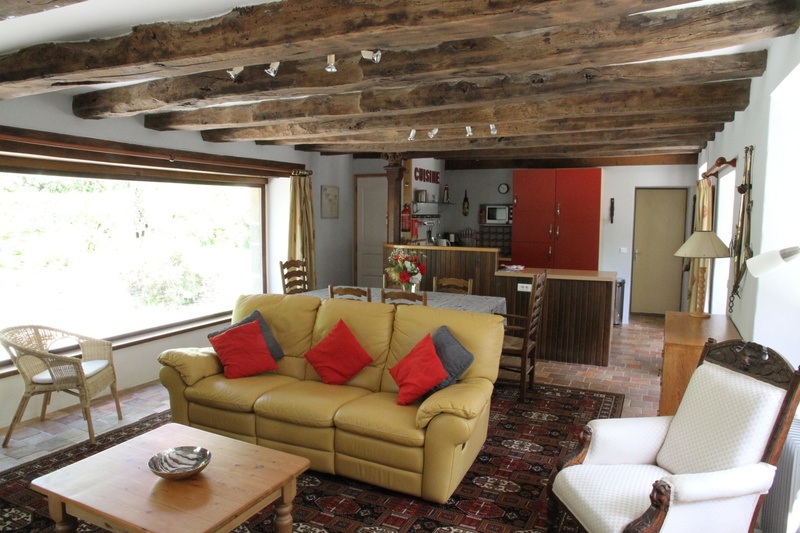 They live in the Loire valley but it turned out have a holiday house locally and their daughter was having a new years eve party for her friends. As you might imagine parents and teenage children’s’ parties do not go well together! Mme left some earrings on the bedside table at Coat Amour and Jenny e-mailed her to say so. The return e-mail came back with a different name on it than her married name (not at all uncommon in France, and yes they were her earrings). 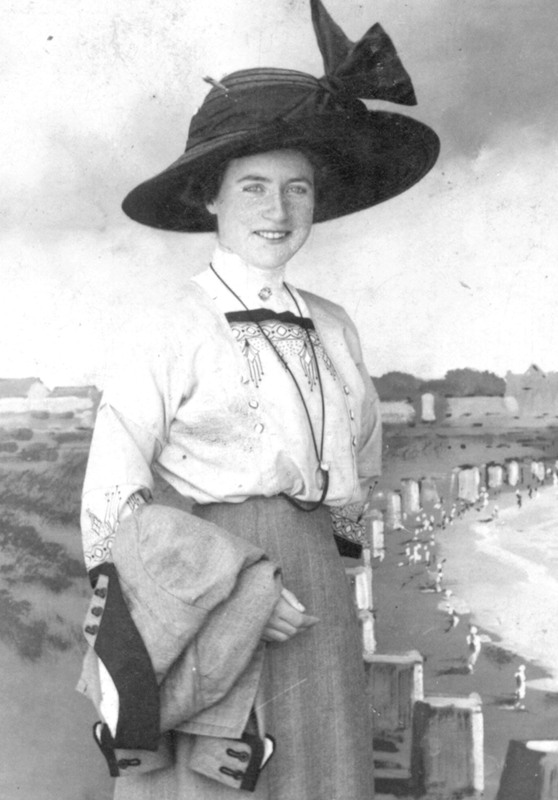 Two days before this we had received an e-mail from an English couple who wished to bring their elderly mother to Morlaix to find a chateau, where her mother had been a governess during the first world war. We were told the name of the chateau and the name of the family and asked if we could help find where this was. We put the two e-mails together and found that name and chateau matched. 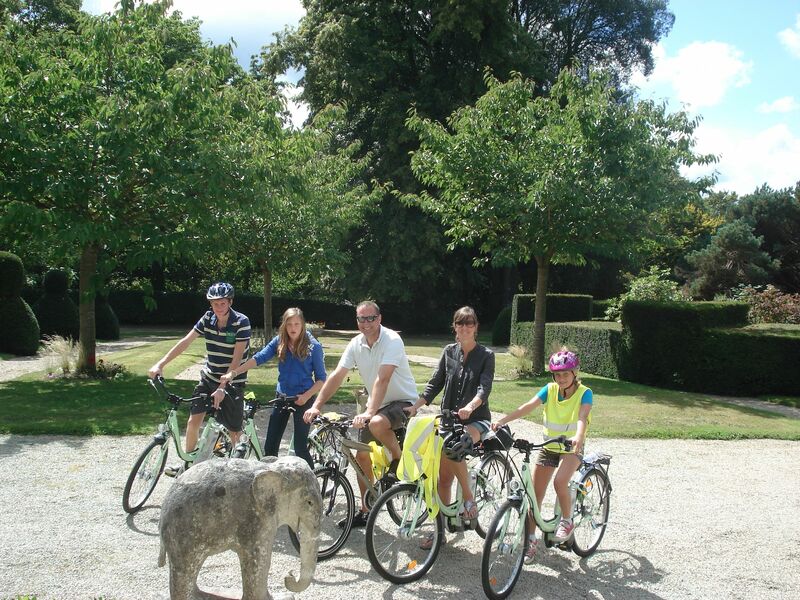 So ~ just a few days ago we were able to take the English couple and their mum to the chateau and walk around the grounds. Needless to say “elderly mum” was thrilled and moved by the emotional experience. 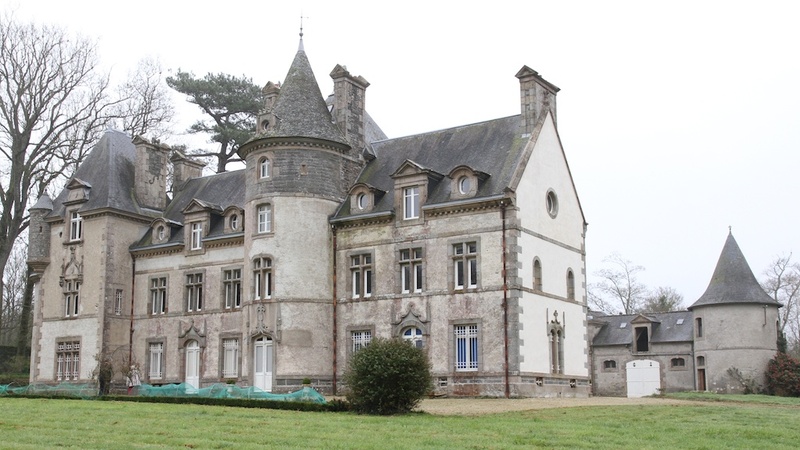 Jenny and I had a great morning with them sharing a little bit of history and visiting a local private chateau. Now that is a co-incidence. Jenny and I have picked many kilos of figs this summer and our cupboards are full of jams and chutney already. We thought that the fig tree were exhausted and had finished for this year. Imagine my surprise at finding a tree with loads of ripe figs, ready to pick, and on 9 November. 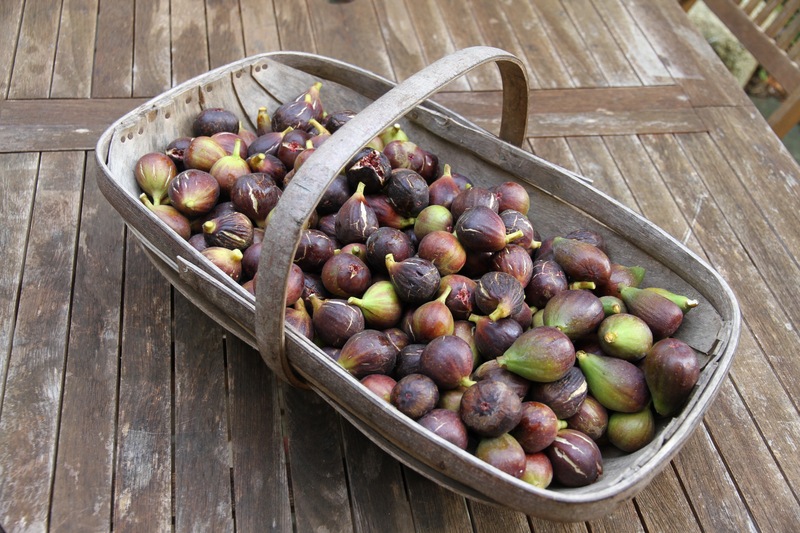 I picked 6 kilos of figs and filled a trug. Our guests had fresh figs for breakfast this morning and Jenny has made some more jam this afternoon. Things in the garden are definitely a little wonky this year, as we also have several rhododendrons in flower now and some of the magnolias have some pretty advanced buds on them. They are all in for a massive shock soon. Before the inauguration of the railway from Paris to Brest in 1865 it took 72 hours to travel to Paris on horseback and only 32 hours by boat. The railway between Paris and Rennes was completed in 1857. The Western Railway Company wanted to extend the railway line to Brest through the centre of Brittany. Such a route would have avoided the construction of many large viaducts over the deep valleys of the northern coast. 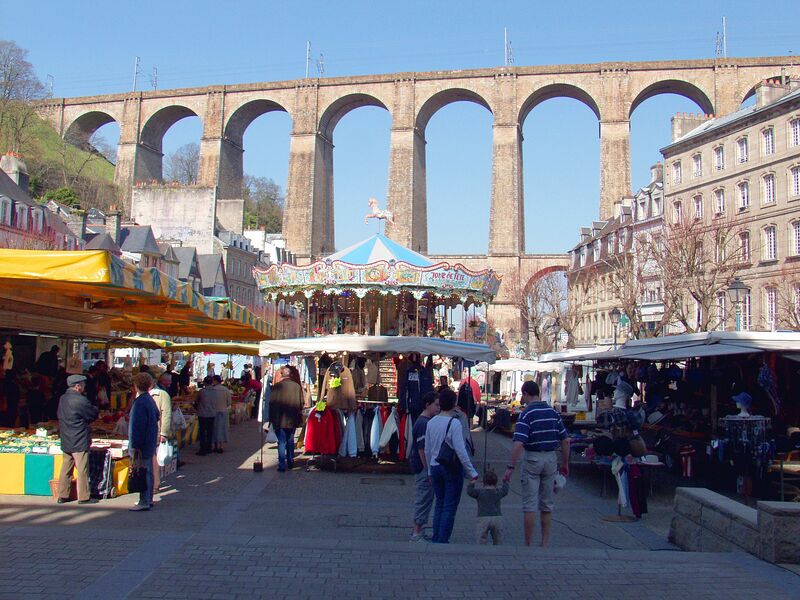 The towns of Morlaix, St Brieuc and Guingamp objected to this proposal. They argued that by taking the railway through the least populated parts of Brittany the railway would lose more trade than if they built it along the north coast. Eventually Napoleon III made the decision that the railway had to be built to pass along the north coast to serve St Brieuc, Guingamp and Morlaix. 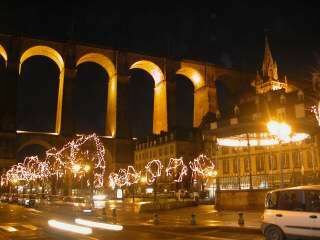 It was decided that the railway station serving Morlaix would be built on St Martin’s Hill at the end of a new viaduct. 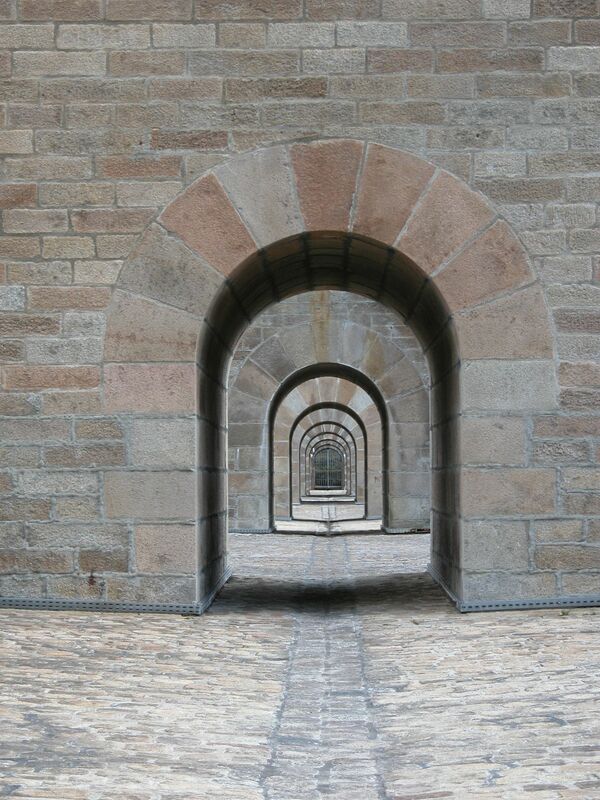 The construction of the viaduct took 900 men two and half years, between 1861 and 1863, to build. It was the biggest construction site of the day in France, similar now to the recent construction of the viaduct at Milau. 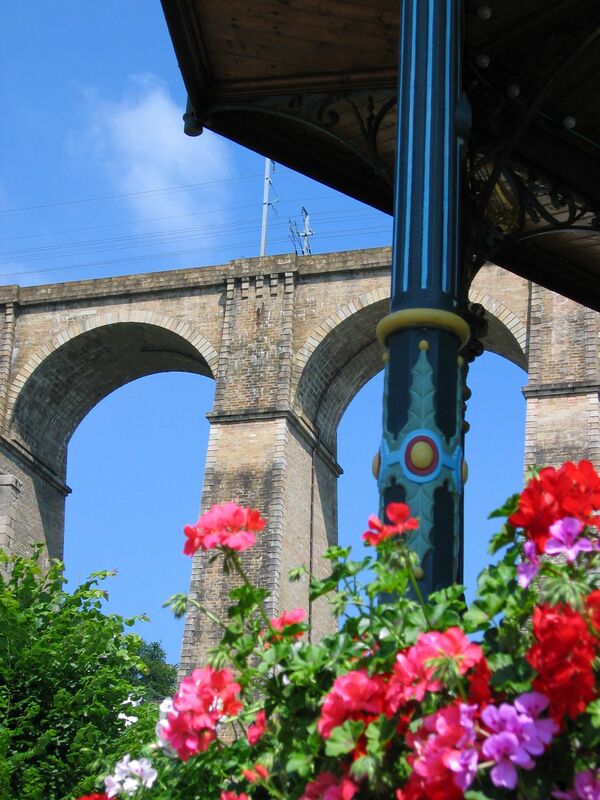 In 1861 the top of the harbour at Morlaix finished close to site of the new viaduct. Stone from the quarries arrived by boat and were carved to shape on the quayside. These stones were used in the external facing to the viaduct. The stones used in the interior of the structure are not carved and irregular in shape. This makes the structure of the viaduct more flexible and more able to resist the pounding and vibrations generated by trains passing over it. All the building materials were lifted into position by steam crane. When this railway line was built the construction of the railway embankment just north of Coat Amour effectively cut off the spring water feeding the leat that powered the watermill belonging to the estate. When Jenny and I moved to Coat Amour we found a surveyors map, dating from 1863. The map shows the line and levels of the then proposed railway line from Morlaix to Concarneau passing though the estate. It fell into disuse and is now a Voie Verte (public footpath) that passes right alongside Coat Amour. It is a marvellous resource and we often go for a stroll along it with Phoebe our dog. 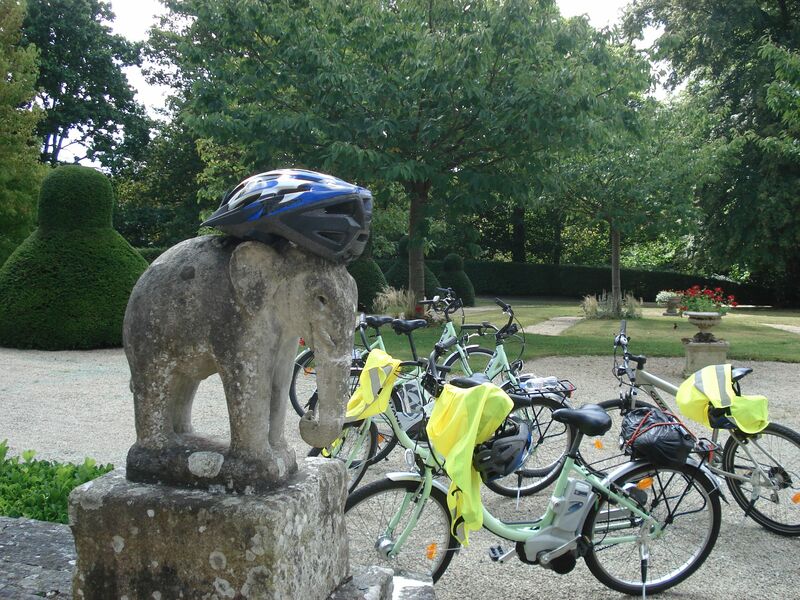 Many of our guests use it for an early morning run, whilst others arrive by bicycle via this Voie Verte. The map, bye the way, is framed and on the staircase going up to the first floor. 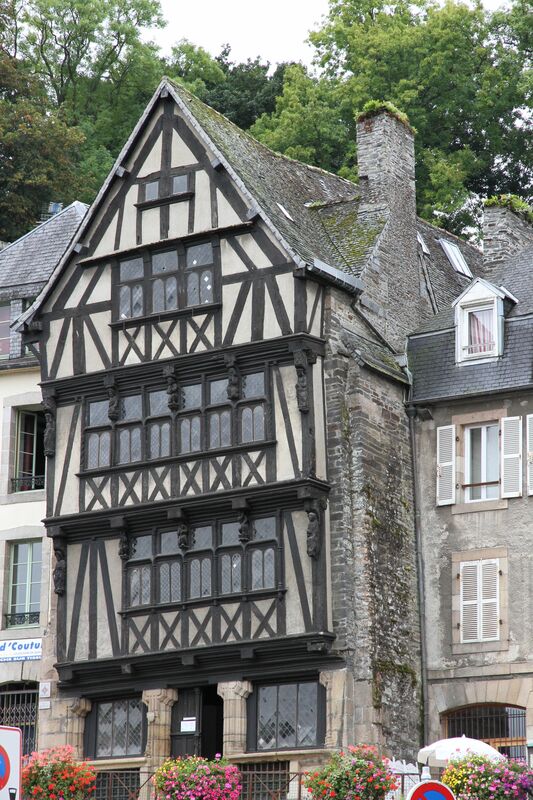 Morlaix is fortunate in that it has managed to retain approximately one hundred and twenty 15th and 16th century timber framed buildings. La Maison du Pondalez is a typical Morlaisian house, built in the 16th century and then inhabited by a nobleman. 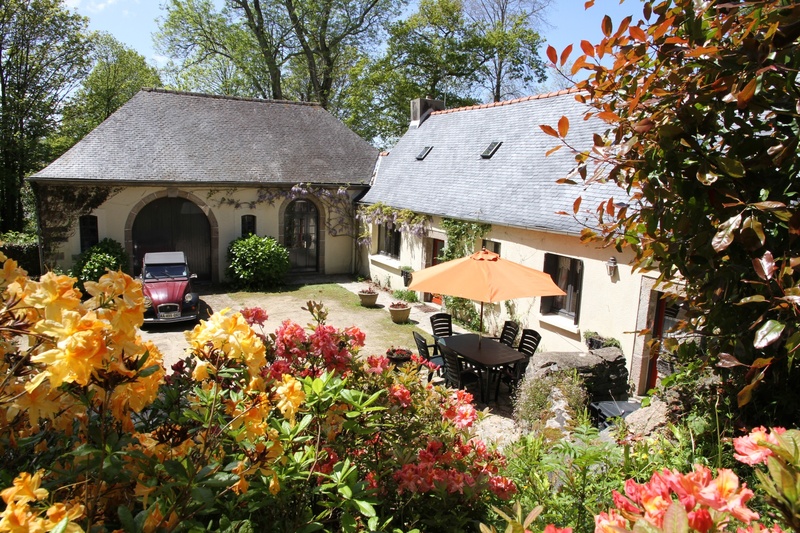 La Maison du Pondalez is located in the heart of Morlaix, in the street called “la grand rue”. It was, and still is, a commercial street where, in the past, the linen traders were found. In those days the harbour in Morlaix was very active and the trade in linen contributed towards the great wealth of the town, and the area. The 14th century “War of Sucessions” made many noblemen poor. Those who wanted to trade in linen, to earn money, had to give up their noble titles in order to do so. By surrendering their nobility they also gave up many privileges but felt ashamed to have to do this. In order to make themselves feel, and appear, more important they built themselves splendid homes, whose architecture was inspired by their rural manor houses. The interior designs of these houses are unique in the world, and a very special feature. 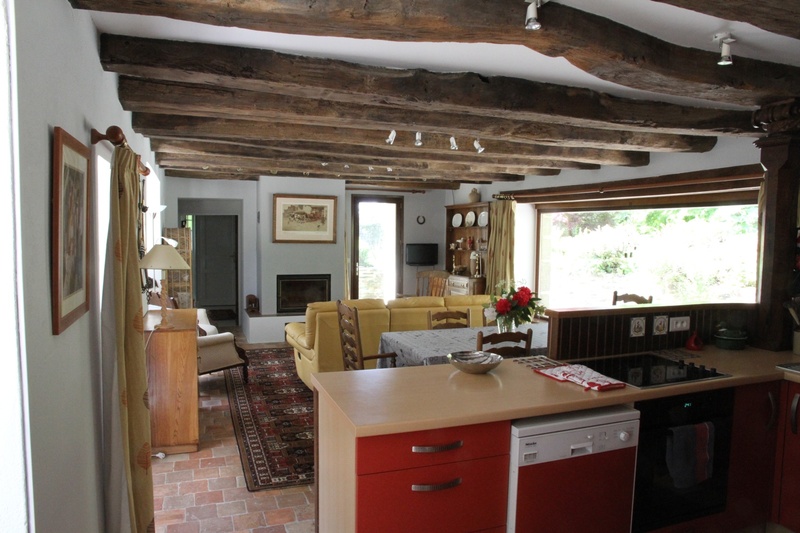 These timber framed houses are called “maisons a pan-de-bois” or “a columbages”. The space between the timber frames is rendered with a mixture of clay and straw, or sometimes horse or cow hair. The outside face of this is covered with a lime wash to help keep out rain water. This house has three floors, and each floor projects forward in front of the one below and is called corbelling. Do you know why corbelling is used in the design? ≈ It serves as a form of protection for the house, reducing solar gain, by creating shadow, and it helps to stop rain water running down the face of the building. The distance between similar houses on either side of a street is about 5.8m at ground floor level and only about 3.3m on the top floor. Some timber framed houses have had slates hung on their facades to keep rain water out. 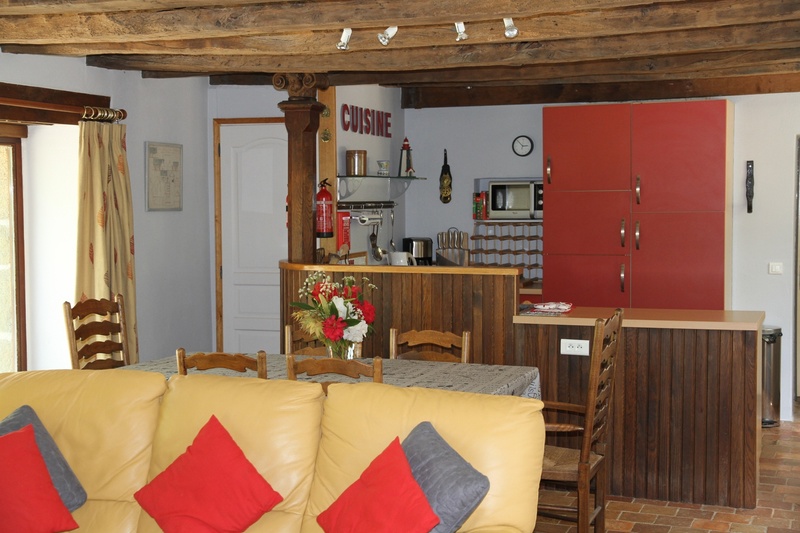 La Maison du Pondalez house does not, however, it is possible to see many nearby that do. On the front of this house there are many sculptures and it is possible to imagine how wonderful this street must have looked when all the houses had such statues. 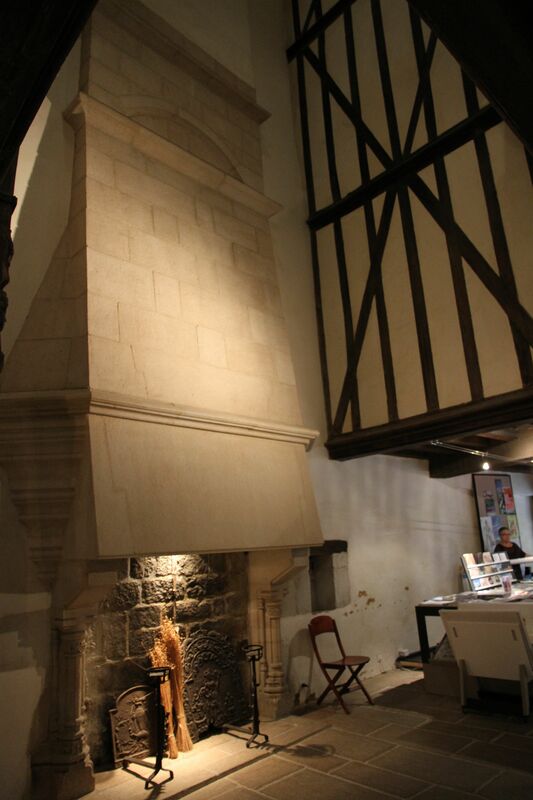 On the first floor there is the statue representing “L’Annonciation” or “Lady Day”, with the Angel Gabriel on the left and the Virgin Mary on the right. The two statues in the middle represent two angels playing music. Together these represent both themes normally found in sculpture, namely religion and feasts. On the second floor there are the statues of St Jacques, St Laurent, St Nicolas and Ste Barbe. Sainte Barbe is the protectress saint of the town of Roscoff. Sainte Barbe is also the patron saint of firemen So the sculpture of Sainte Barbe on this house acted as a good luck charm against the possibility of fire. Wooden houses, built so close together, burn very easily, however, the designers incorporated stone walls between each house to prevent the spread of fire. 1. The Booth (shop) was where business was done. Goods or commodities were presented for sale on a stall. When the shop was closed for business the stall became a shutter. This one was restored completely a few years ago The stained glass windows have been restored too, using the original methods of construction. It is made up of little pieces of blown glass set into lead cames (H shaped pieces of lead that clamp the glass between the wings of the H). 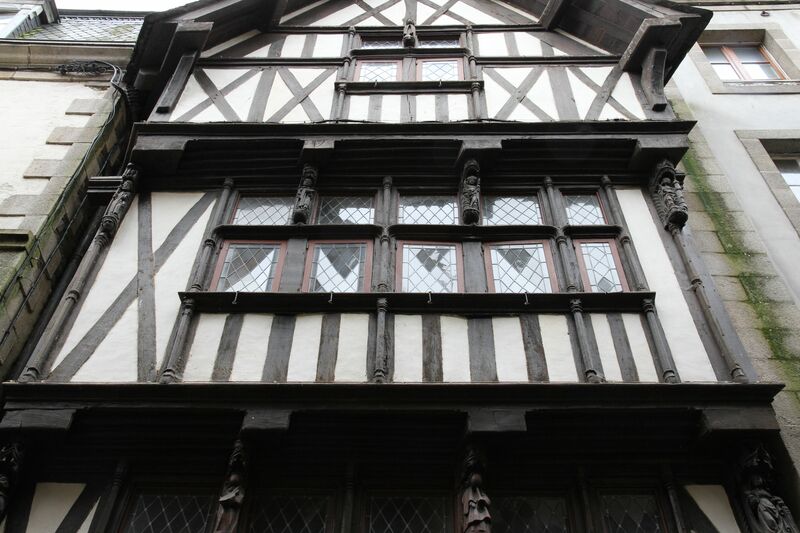 The original windows opened outwards, unlike most windows do in France today, and the hooks are still there that fixed them open and served to prevent them from banging. 2. 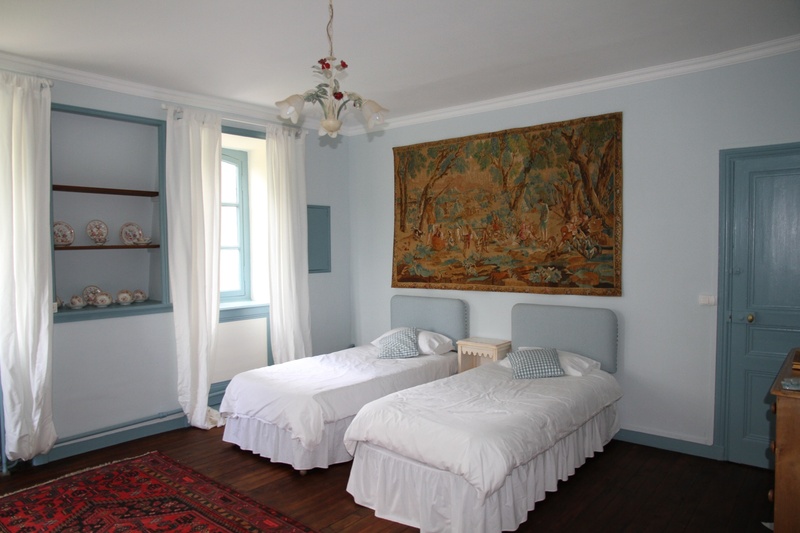 The Manor Room was a common space, inspired by the design of the Breton manor houses. This space is unique as it provides a central atrium running up through the house from ground floor to the underside of the roof. 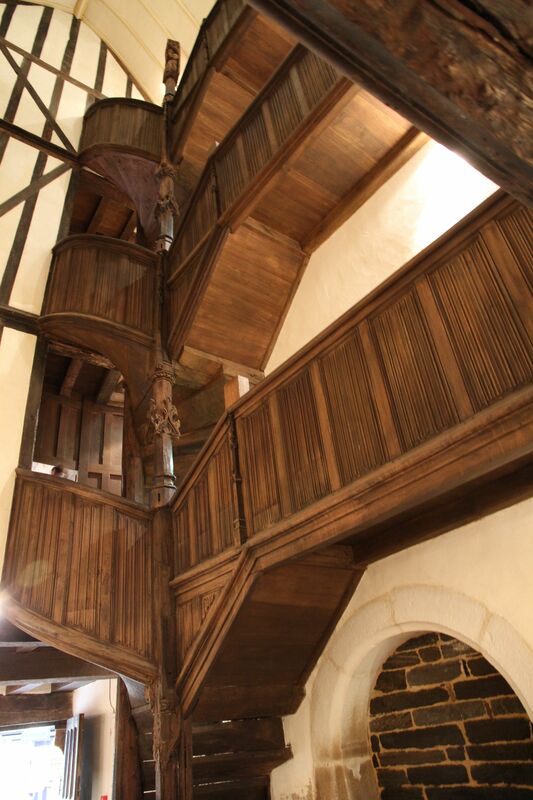 There are spiral staircases linked by little bridges called “pont d’allees” or “pondalez”. This Breton word means “landing” or “corridor”. 3. The Back Room was either a bedroom or cellar. It’s exact function is not really known. Anne de Bretagne, who was born and lived in Nantes, was crowned Duchess of Brittany (Duchess Anne) on 10 February 1489. Duchess Anne was twice Queen of France, having married Charles VIII in December 1491 and then Louis XII in January 1499. In June 1505 she decided to visit her region, and when she visited Morlaix she was received with acclaimed and made most welcome. This house is called “the Duchess Anne House”, not because Duchess Anne stayed here, she did not, but the house was new when she visited Morlaix, and has been known by this name ever since. We can see many sculptures on the front elevation, representing one of the most common themes: “the feast”.